Accurate and reliable assessment of speech quality within VoIP and PSTN networks is vital for the satisfaction of the end-user or customer experience. Businesses spread across geographic locations and increased telecommuting has triggered drastic demand for VoIP phones. Consequently, VoIP phone manufacturers face tremendous pressure to ensure mass production, while also ensuring devices have latest features and at the same time they are free of noise, echo, and other hindrances which may cause a degraded voice quality. GL provides VoIP manufacturers and developers with a test solution to evaluate IP phones according to international ITU-T standards for measuring end-to-end audio performance as well as the acoustic performance. End-to-end Speech quality assessment can be done using objective evaluation method which involves industry standard algorithms such as POLQA and PESQ in order to compare original and processed speech signals. When testing, the customer may place a call between two IP Phones (DUT) with the VQuad™ Probe HD connected to the IP Phone for sending/recording audio. 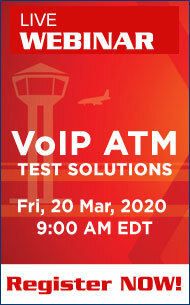 This scenario can also be used to test the VoIP network. Any of the possible scenarios described below can be considered for testing. The results from VQuad™ and VQT will help compare the speech quality measurement scores based on different voice codecs with support for Narrowband, Wideband, Super-Wideband. POLQA supports the latest HD-quality speech coding and network transport technology, with higher accuracy for 3G, 4G/LTE and VoIP networks. GL’s VQuad™ Probe HD or the VQuad™- Dual UTA HD test equipment supports intrusive call quality assessment. It is a comprehensive hardware device designed to interface at end points and test the voice quality of telecommunication networks. The test equipment features all the circuitry necessary to universally adapt to any telephony instrumentation, including VoIP phones. The entire procedure of placing and receiving calls between end points is automated; quality is measured and reported centrally for verification. The VQuad™ Probe HD contains 2 Handset testing interfaces (RJ22). This allows the user to replace the handset of any telephone at the Curly Cord. This method is applicable for POTS, Digital PSTN and VoIP telephones that contain a handset. The VQuad™ Probe HD contains two FXO ports for analog call control, Bluetooth® for wireless call control, as well as two Ethernet ports for SIP call control to directly interface with the VoIP network. This allows the user to replace one of the telephony units with VQuad™ Probe HD at one end for testing. This method is applicable for POTS, VoIP and Wireless networks. The VQuad™ Probe HD contains 2 pairs of Balanced I/O (3.5mm In/Out jack) testing interfaces. Balanced I/O is used for connecting to a VoIP Softphone (i.e. Skype), Head and Torso Simulator (HATS), Ear and Mouth Simulator, or any device supporting audio (including Mobile phones). In this scenario shown below, the VQuad™ Probe HD In/Out Audio ports on Side 2 are plugged into the Mic/Speaker connection of a PC, for instance connecting to a softphone such as Skype. This connection basically represents a Headset connected to the PC. The VQuad™ Probe HD In/Out Audio ports on Side 1 are plugged to the Ear and mouth simulator (acting as Head and Torso Simulator (HATS)) which provides a realistic reproduction of the acoustic properties of an average adult human head and torso, receiving and transmitting any audio from the IP phone device in the proximity. 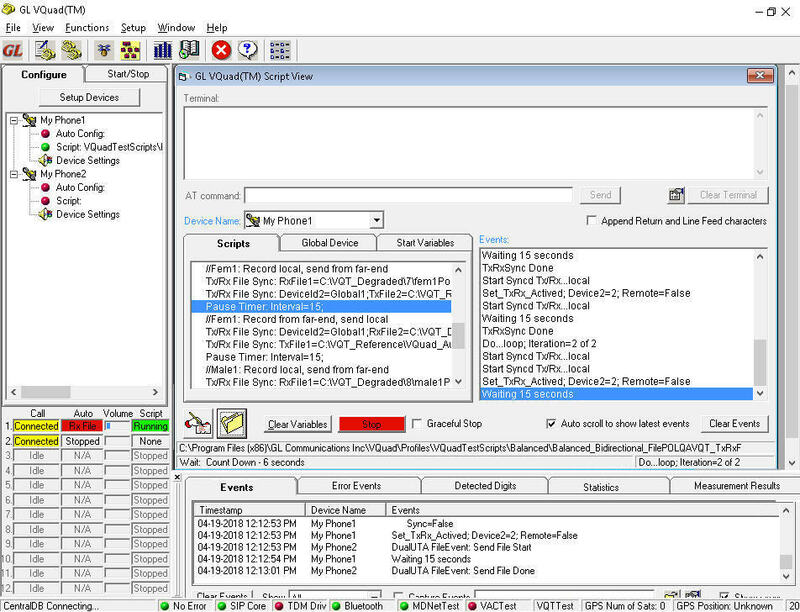 VQuad™ supports full automation of Call Control as well as traffic (sending/recording audio) using the VQuad™ Scripting. The VQuad™ Scripting can be very simple or quite complex depending on the testing requirements, and a single VQuad™ Script can control both sides of the call. 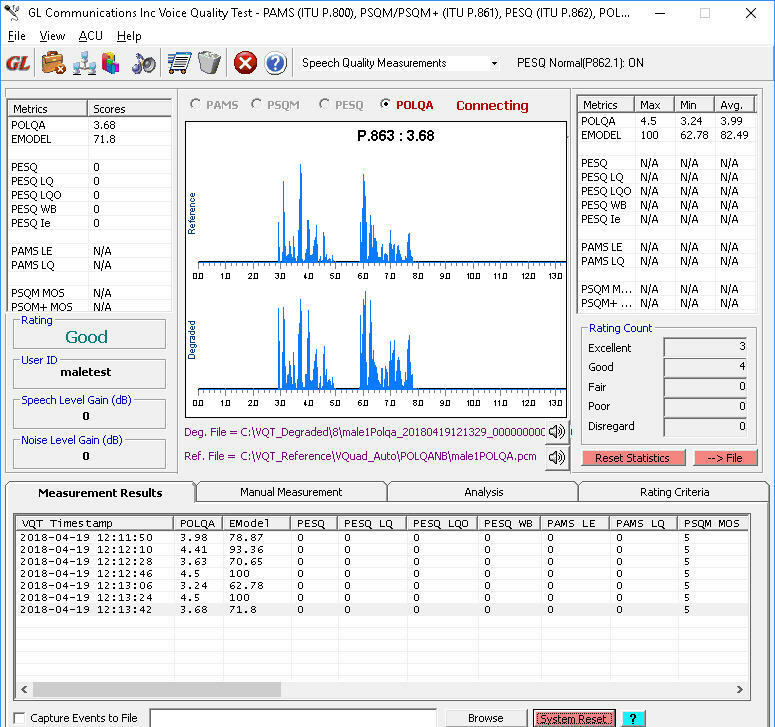 The VQuad™ solution can send/record audio during the established call and transfer the recorded audio to the GL VQT software for automated analysis using either VQT POLQA or VQT PESQ algorithms. The VQT software generates the MOS along with several audio metrics.